If you were able to stop by our Oxford location recently, you may have noticed a big change. We’ve recently updated our signage, and we think it looks pretty snazzy! You’ll now find one large blackboard, with sizes, options, merchandise, and flavors, all priced and organized in an easy-to-read, fun format. The scoops on the right are updated with our current flavor selections throughout the day, and you can easily sort through our toppings, options, and other fun offerings as well. We are super excited about it, and it looks like our Facebook friends are as well! If you have any feedback, drop us a line, or comment on the post. We’d love to hear from you. We’re right next door to Capsize OX|MD! Eat Whatever You Want Day! Sign up here to get our newsletter in your inbox! 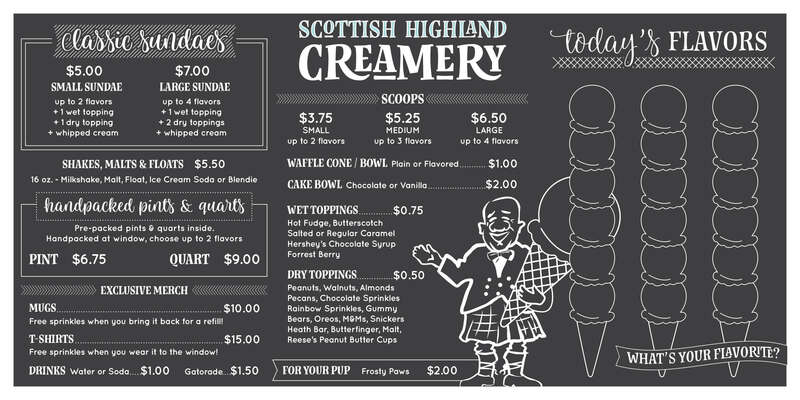 © 2019 Scottish Highland Creamery.